Card. Theodore McCarrick enjoyed the "state of grace" of the Conciliar Popes during his entire career. Made Auxiliary Bishop of New York by Paul VI (1977), he became Bishop of Metuchen, New Jersey (1981-1986) under John Paul II, who elevated him first to be Archbishop of Newark (1986-2000) and then promoted him to the prestigious position of Archbishop of Washington (2000-2006). Pope Wojtyla also gave him the cardinal hat in 2001. Benedict XVI kept him in his post until McCarrick reached 75 year of age, when he retired with honors and prestige. 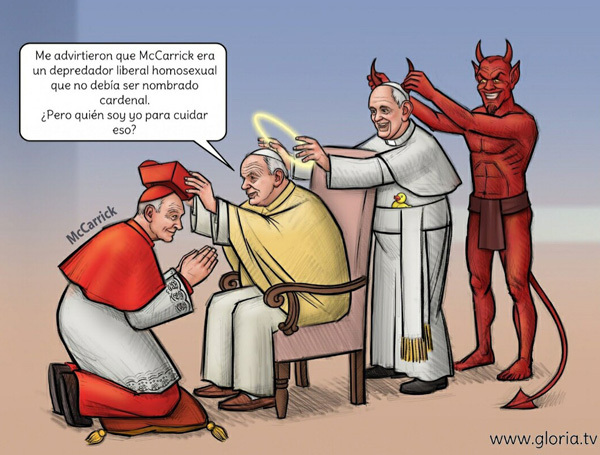 All this time McCarrick had been a homosexual predator preying on his seminarians and priests, and it is impossible to suppose that the Popes were not informed of it. Pope Francis was good friends with Card. McCarrick as well, see below first row the strong affinity between the two ecclesiastics. Notwithstanding, yesterday, July 28, 2018, Francis accepted the resignation of McCarrick from the College of Cardinals and imposed on him a life of "prayer and penance." 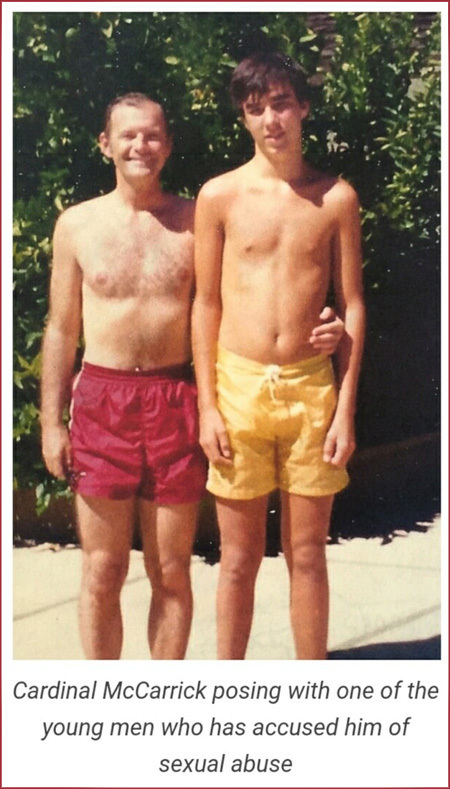 This type of "punishment" is reserved to publicly guilty homosexuals and pedophiles in the episcopate and clergy. The reason for the "punishment" is not because these persons infringed a great level of morality in the Conciliar Church, which would demand their retirement from the public sphere. Instead, it is the blow of the media against those individuals and the association of their impunity with the ruling religious authorities. In other words, to these authorities, "it is only bad if you get caught." Therefore, what is causing those people to be "punished" is just the hullabaloo produced by the media about their exemption from punishment, which is projecting a very bad image on the religious authorities among the public. Is it not an irony that the moralizing stimulus of the Conciliar Church comes from the indignation of the immoral media? who should not be made a cardinal. But, who I am to judge this?"